The Letchworth Trail, located on the eastern side of Letchworth State Park, is part of the 900+ mile Finger Lakes Trail System. The Finger Lakes Trail Conference headquarters is located just off the trail in Mt Morris, near the Mt Morris Dam. The trail at times comes very close to the edge of the canyon. This trail may not be suitable for everyone due to the proximity to the sheer cliffs. The trail has yellow blazes and does coincide with the Genesee Valley Greenway for a short period during the southern section of the trail. 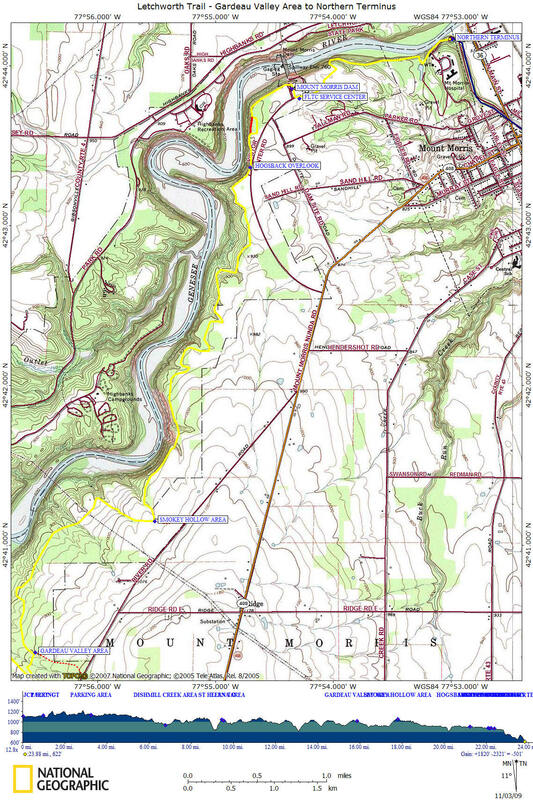 The southern terminus of the trail is the Finger Lakes/North Country Trail at the Whiskey Bridge and the northern terminus is the junction of the Genesee Valley Greenway Connector Trail. 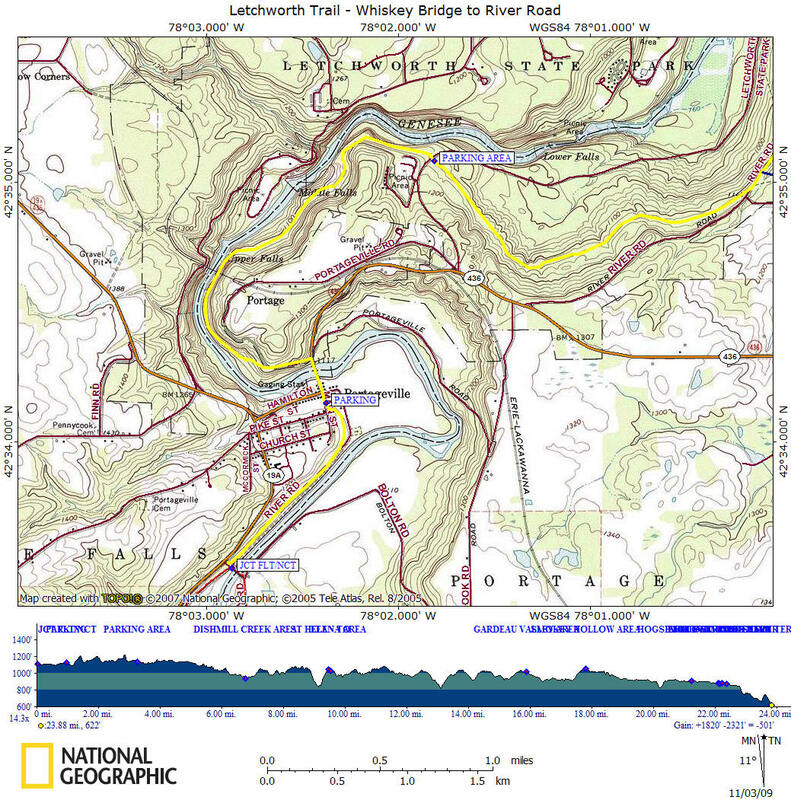 The Letchworth Trail is officially 25.4 miles (one way) with an overall elevation gain of 1820 feet as well as an overall elevation loss of 2321 feet. However, our gps has the trail at 23.9 miles. There are numerous side trails that lead to access points along River Road. There also two side trails that lead to view points (Owls Fork Ravine and Fidler's Elbow). There are numerous other spectacular views along the trail. There are two shelters located along the trail. 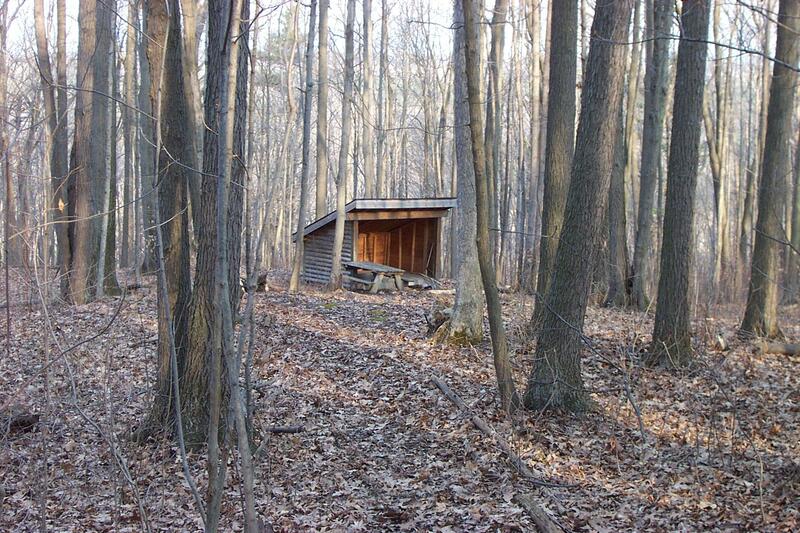 You will need a permit from the NY State Parks Department in order to use the shelters. Contact the Letchworth State Park Office for more information. If your looking for solitude in the sometimes crowded Letchworth State Park, then this is the trail for you, especially if your looking for a backpacking hiking trip. However, you don't need a backpacking trip to enjoy this great trail. There are numerous day hike opportunities. We have listed two great day hike options above. 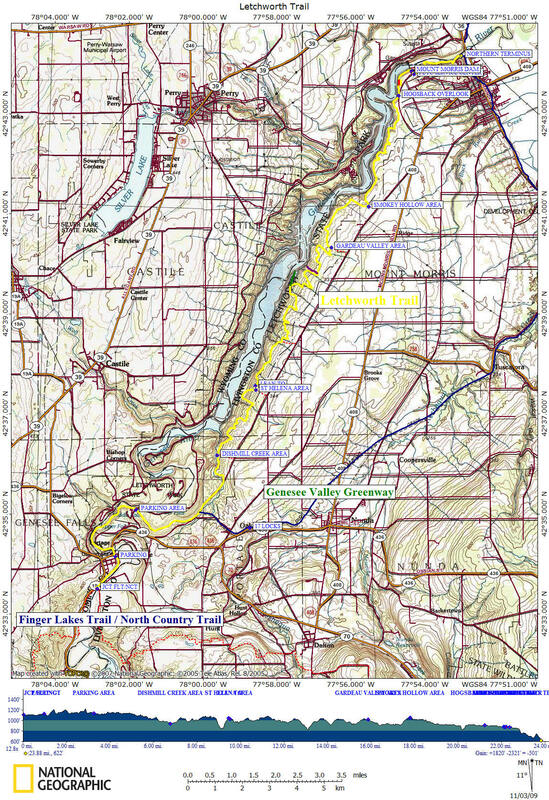 You can help support this trail by purchasing the official maps and guides of this trail directly from the Finger Lakes Trail Conference website. Look below for pictures, a couple of videos, a detailed trail description and numerous maps of the Letchworth Trail. Southern Terminus of Letchworth Trail at the FLT/NCT junction near Whiskey Bridge. Parking. Follow yellow blazes north. Following old railroad bed. Trail coincides with Genesee Valley Greenway. View of Genesee River and Portageville. Pass under the high bridge of the Norfolk Southern Railroad. Upper Falls view. Trail leaves old railroad/canal towpath and enters "slide area". This section tends to be muddy. View of Middle Falls & Deh-ga-ya-soh Falls is just off main trail. Trail is back on old railroad bed. There are numerous side trails that lead to view points at the very edge of gorge over next 0.35 miles. Take extra care if you go to the edge of the gorge! A short side trail on left leads to a ledge with a great view of the gorge & Inspiration Falls. Reach River Road. Parking. Soon the Genesee Valley Greenway turns right. Letchworth Trail now follows River Road. NOTE: The remains of a series of 17 locks can be observed about one mile east along the GVG. Trail turns left off River Road. Dishmill Creek Area. Blue access trail on right leads 0.4 mile to River Road and parking. St Helena Area. Blue access trail on right leads 0.3 mile to River Road and parking. Blue access trail on right leads 0.35 mile to River Road and parking. Blue spur trail on left leads 0.35 mile to Owls Fork Ravine overlook. Blue spur trail on left leads 0.4 mile to Fidler's Elbow overlook. Gardeau Valley Area. Blue access Trail on right leads 0.4 mile to River Road and parking. Smokey Hollow Area. Blue access Trail on right leads 0.25 mile to River Road and parking. Junction of Orange Blazed Trail. Letchworth Trail turns right into pines. Orange Trail on left. Letchworth Trail turns right. Cross under power lines. Views. Trail soon enters Mt Morris Dam Parking Area. Mt Morris Dam overlook area. Parking. Dam Visitor Center. Trail follows Dam Rd. FLTC Service Center. FLT mileage sign post. Trail turns left off Dam Road. Northern Terminus of Letchworth Trail.